The time base for this observation is not known but the duration between each frame is constant. Frame #1: Entry is made with both hands pitched outward indicating that an initial outward arm movement will be necessary to reposition the arms to where they can propel effectively. The body and head are diving down although not as much as some other top butterfliers. The kick is partly completed. The position of the legs indicates that there is some inversion of the knees so that the feet instead of kicking straight down actually sweep out and then in. This could increase the forces created during the kick. Note the turbulence lines coming off the nose. Frame #2: The post-entry outward arm sweep, like that of some breaststrokers, serves to slow the diving action of the head and shoulders and possibly produces a small amount of propulsion through lift forces. In this frame the hips are slightly higher than the shoulders. Much effort is being expended to accommodate the unnecessary diving and resultant hip elevation. The kick is almost completed. Frame #3: The entry is completed and the arms are at their widest before direct drag-dominant propulsion is developed. The head and shoulders have dived even further and as a result, the hips have also risen higher. The swimmer's suit is obscured by the non-streamlined body angle. The head is rising and the turbulence lines off the nose have increased. The kick is completed. Most of the swimmer's actions to this stage have been to accommodate the exaggerated and unnecessary diving action of the upper torso and head. Disruption to streamlining is another bad side effect of this movement. Frame #4: Direct arm propulsion is developed primarily from adduction of the upper arms. Elbow flexion brings the arms closer to the centerline of the body reducing the lateral component of the forces developed by the hand/forearm propelling surfaces. The head rises further and is followed by the shoulders. The hips start to drop as a reaction to that elevation. This picture should make it clear that swimming with a face profile looking forward or even partially forward in any stroke increases detrimental drag resistance. The increased turbulence of the drag resistance off the nose can be clearly seen when it is compared to the amount visible in frame #1. Frame #5: Direct drag-force propulsion from the hand/forearm propelling surface is clearly evident by the turbulence following the lower sections of the arms. The lateral component of developed forces continues to decrease as the hands/forearms sweep inward. Energy for this propulsion is generated by upper arm adduction. The hips continue to sink as a reaction to shoulder and head elevations. The feet rise preparatory to kicking. Drag resistance due to the face profile is maximal at this stage. Frame #6: Propulsion continues although adduction is almost completed. The insweep of the hands/forearms is completed. From this stage extending the elbow and hyperextending the wrists to keep the palm of the hand pushing backward will generate propulsive forces. The knees have dropped down as a "rocker" reaction to raising the head out of the water. Kicking is just about to commence. Frame #7: Hand propulsion is completed and probably has generated some force to maintain the head and shoulders out of the water. The hands have moved backward and upward. The length of the backward push is noticeably longer than that exhibited by average butterfliers. The legs kick to offset the upward movement of the arms as they prepare to exit as well as to support the head and shoulders out of the water. Frame #8: The arms have been extracted and the legs kick. The great power developed by this double-leg kick has to be appreciated as it supports the mass of the arms, head, and shoulders out of the water. Frame #9: The legs start to rise preparatory to kicking to offset vertical forces created by the plunging head and shoulders and the arms' entry. Denis Silantiev is a tall lean swimmer who has very long arms. Emphasizing streamlining and length of direct force application should exploit those physical features. Unfortunately, the opposite is demonstrated in this sequence. 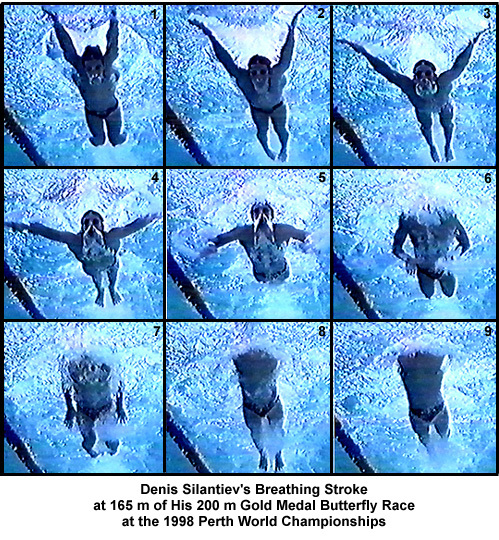 Streamlining is disrupted because of exaggerated diving of the head and shoulders as part of the entry. Outward and inward sweeping movements of the lower arms reduce time spent in direct force propulsion. The "rocker" reaction of the hips causes large volumes of water to be moved requiring significant energy transfer from the swimmer to produce that movement. Significant changes that will result in performance improvements are possible with this world champion's technique.